Both profits and sales exceeded expectations from analysts. Here’s all the ways Apple surprised them. Why this matters: Apple might as well be the iPhone company. iPhone sales account for more than half of Apple’s revenue. Apple takes the lion’s share of profits in the US smartphone sector, despite having the minority of market share. iPhones are the long and the short of Apple’s meteoric rise, and wherever their sales go, so goes the future of Apple. 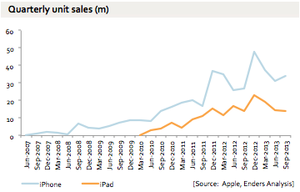 Analysts projected sales of 19.7 million iPads and Apple moved only 16.35 million. 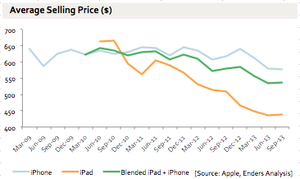 As we noted, there are probably a bunch of reasons for Apple’s rapidly contracting iPad sales. Briefly, they are: the slow rate at which tablets need to be replaced, the fact that cheaper tablets are just as good for most tasks as an iPad, and the fact that most people just don’t need a tablet, so the novelty appears to have worn off. Apple’s boffo iPhone sales more than made up for precipitously declining sales of iPads (and also iPods and even Macs). Analysts projected $43.6 billion in sales, the company booked $45.6 billion. If the rumors of a larger iPhone coming later this year are true, and that helps Apple unlock the “phablet” market in Asia and elsewhere, Apple’s declining sales of everything else might not matter. Truly, Apple is more of a phone company than ever. 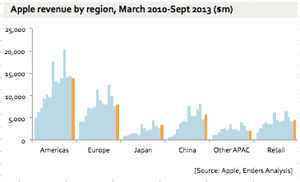 […] The hot new trade of 2013 is in sync with Apple’s year over year calendar shifts. We like to call it calendar chaos. How will this calendar shift affect Apple’s Q1 2013 earnings? Nobody outside of Apple’s own management team has a clue. Last year in Q1, China accounted for a record $7.9 billion of Apple’s revenue because of the ‘mind-boggling’ iPhone launches in conjunction with the Chinese New Year, how did Chinese sales hold up without a new product launch in Q1 2013? Nobody outside of Apple’s management team has a clue. I hate to use this phrase but when you take away apples to apples year over year comparisons, you’re left in the dark. Analyst expectations are all over the place. Because nobody has a clue, investors are consumed with negative uncertainty. For the first time ever, the whisper number for Apple earnings on April 23rd is actually below analyst expectations. We’re assuming this will be the ugliest quarterly report since 2003. As a result, the stock has sold off another $75 in the weeks leading up to it. Calendar uncertainty has left us in no man’s land. The greatest company in the world now has a p/e less than Dell. What’s going on? Year over year quarterly earnings comparisons no longer provide an accurate indicator of Apple’s health and yet Wall Street refuses to deviate from its time tested tradition. 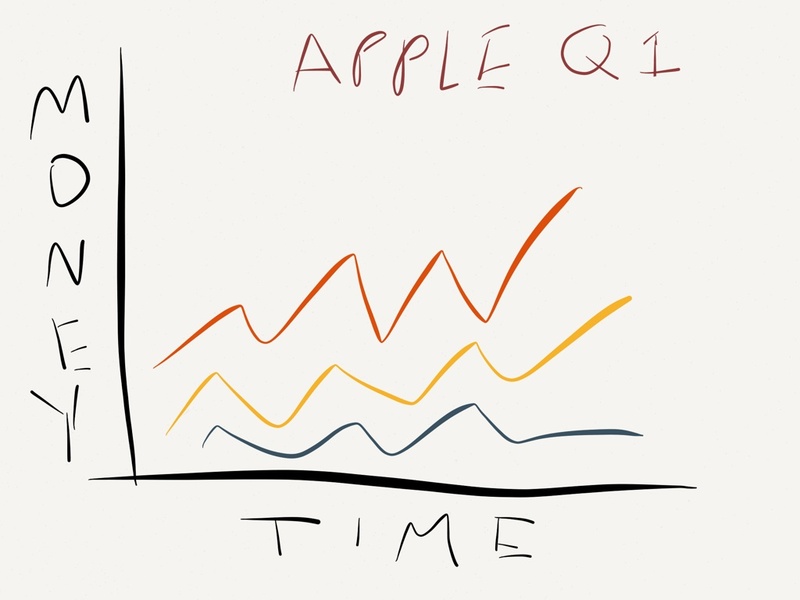 This simple disconnect has created a new paradigm for Apple stock action. The stock will flourish when the next quarter has a product launch advantage compared to its year over year counterpart and the stock will sell off when the next quarter has a product launch disadvantage compared to its year over year counterpart. For those who are interested in an accurate view of Apple’s health, analyze 12-month data rather than 3-month data. 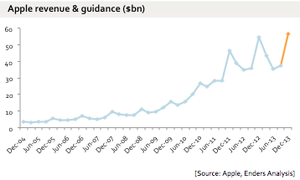 During calendar year 2012, Apple grew revenue by 28.7%, net income by 26.4% and iPhone unit sales by 45.9%. This growth expectation fits perfectly with today’s Verizon data that showed a 25% year over year increase in iPhone sales. 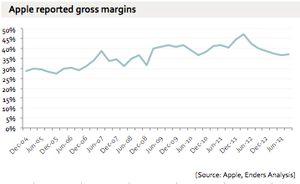 Apple appears to have settled into to a mature growth rate between 20%-30%. To put this in perspective, the earnings growth rate of the S&P 500 in Q4 2012 was 4.1% and the expected growth rate for 2013 is 3.2%. Google’s core revenue growth rate in Q4 was 21%. Can Apple rally with 20%-30% growth? Of course it can. The problem is that quarterly data skewed by calendar chaos will mislead investors to the downside in a bad quarter and will mislead investors to the upside in a good quarter. More transparency about Apple’s overseas operations. Corporate philanthropy for the first time in years. A dividend and stock buyback program. Oh, and continuing to roll out amazing products one after the other. Let no one say Tim Cook isn’t putting his own mark on Apple.